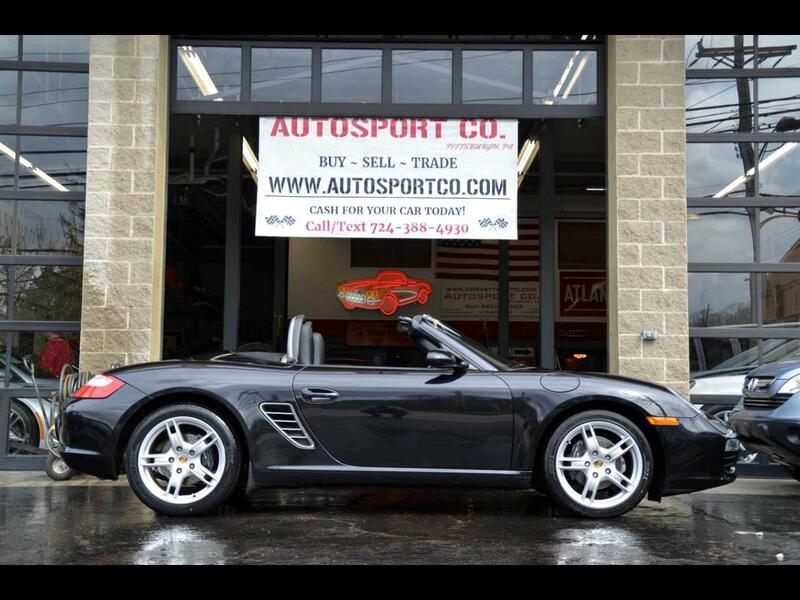 Used 2005 Porsche Boxster Base for Sale in Indiana PA 15701 AutoSport Co. Offered for sale is a Clean Carfax/1 Owner, 2005 Porsche Boxster with only 29k miles, a manual transmission and a brand new set of tires! With a factory rated 245HP, this 2.7L 6-Cylinder Engine runs out very smooth and matched with a 5-speed manual transmission this is a fun Porsche to take out and enjoy! Around the black metallic exterior of this Porsche, there in minimal wear present and the premium “Boxster S” wheels are in great condition and have recently been fitted with brand new tires. The power convertible top functions properly with no lags or issues and is in overall great condition with minimal wear present. Throughout the smoke free, black leather interior no abnormal wear is present. The dash area, carpeting and console area all show very well! In addition, this Clean Carfax/1 Owner, 2005 Porsche Boxster with only 29k miles is equipped with features such as: 2.7L 6-Cylinder Engine, 5-Speed Manual Transmission, Heated Leather Seats, Power Convertible Top, Premium “Porsche S” Wheels, Brand New Tires, AM/FM/CD Player, Porsche Premium Stereo System, Power Rear Spoiler, Original Books and Manuals, 2 Sets of Keys, Current PA Inspections and much more!! There is a small scuff on the rear bumper that can be seen in the photos. For more information feel free to call/text Anthony at 724-388-4930. This car is located at our PITTSBURGH location; we accept trades and can help with financing options. Thank you for your interest!